Weaning your baby from breastfeeding is a natural stage in your baby’s development that often comes with mixed emotions. This is completely normal. Throughout the weaning process, remember to stay close to your baby. Comfort and cuddle him like before and you will come out of the process feeling just as close as you ever did. Of course, the longer you can continue to breastfeed, the more health benefits there are for your baby. But there will come a day, sooner or perhaps much later, when you decide to wean your baby from the breast. Remember, there is no pressure on you regarding this move. Only two people should be involved in the decision to stop breastfeeding: you and your baby. Everything you do should feel natural and right and never rushed. When you decide to no longer breastfeed (or perhaps stop because you are unable to), we have some handy mom-approved tips for a smooth transition. Remember that there is no rush. Take a gradual approach and give yourself time to adjust both physically and emotionally. Also think of his state of mind. He is having to change to something new. Pick a time of day when he is not typically hungry and will have more patience to explore new tastes. Start by replacing one feeding per day with infant formula. Wait a week before replacing another feeding. Continue to alternate the breast that is offered first. During the weaning process, if your breasts become swollen, tender, and sore, squeezing out a little milk or applying a cold compress to the area can help the swelling go down. Over-the-counter pain relievers like acetaminophen or ibuprofen are recommended. How do you know if you have developed a blocked duct? Especially during a more abrupt weaning process, be sure to check regularly for a firm pea-sized area that may be tender to the touch. Do not worry if this happens to you, it is not at all uncommon and can be easily treated at home. Simply apply a gentle outward rubbing motion until it clears. If this is too painful, consult your doctor or lactation consultant right away. Of course, if your baby has never used a bottle or tasted formula, you have two changes to introduce. Start by offering breast milk in the bottle during his “least favourite” feed of the day. 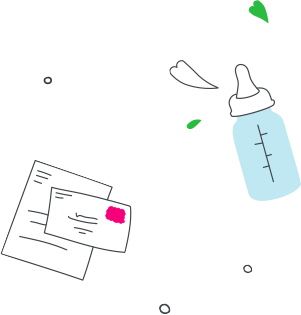 Once your baby is comfortable with the bottle, start to introduce the formula in it. Babies do not necessarily enjoy change (they tend to be creatures of habit) and this approach will help him ease into his new lifestyle more easily. Canadian Paediatric Society. Caring for Kids — Weaning your child from breastfeeding. 2013.
can help you get the energy and nutrition that you need while you are breastfeeding.